A brilliant frame can be constructed out of aluminium, steel or titanium, as frame materials are just one component of the overall frame design. What generally matters most is that the frame in question is offered by a manufacturer who has a history of building good and reliable touring bikes. A good touring bike must also be sized correctly for you with a suitable touring geometry. As metallurgy gets a bit technical, I’ve written this article with as little jargon as possible so that it makes sense. 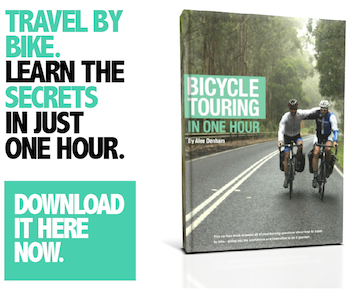 An aluminium bike, a steel bike and a titanium bike; any of these materials can be used to make a great touring bike. Frame Materials: Which is Most Comfortable? 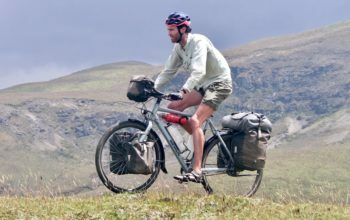 Has anyone ever told you that steel and titanium touring bikes are comfortable and that aluminium frames result in a rough ride? Believe it or not, bike frames actually account for very little of the overall vibration damping on a touring bike, especially when it’s loaded with bags. Road vibrations are mostly absorbed through your tyres, seatpost and saddle. Think about it. Your tyre encounters a bump in the road, deforming and dissipating huge amounts of shock – a few millimetres on a narrow tyre right through to centimetres on a wide touring tyre. Your rim, spokes and hub are next, but their effect on shock is minimal. Your hub transfers the remaining shock through the frame seatstay and up the seatpost where another significant effect on shock occurs – up to 25mm on some carbon posts. Lastly, your saddle will absorb a bunch more shock. So perhaps a few millimetres of vertical flex separates some aluminium, steel or titanium frames, but let’s face it – it’s minimal when you consider all of the components that damp shock. All frame materials will tour comfortably with good tyres, a seatpost designed to flex and with a cushioned saddle. There is little difference in comfort between different frame materials. One of the biggest sources of comfort comes from the tyres. All bikes have resonant frequencies at which they vibrate; in fact, everything you see around you is vibrating at one frequency or another. It is said that resonance can affect the comfort of your bike, but for the most part, components such as your tyres, grips, seatpost and seat will damp the majority of road vibrations. 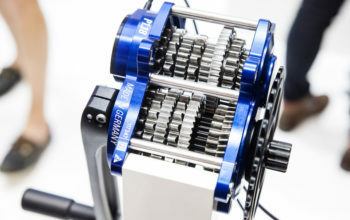 Resonance can be a problem when it builds up so much that you develop ‘speed wobbles’ while riding at certain speeds. Bikes that ‘speed wobble’ also tend to lack stiffness. 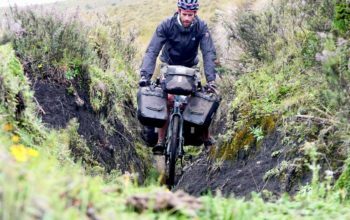 Luckily most dedicated touring bikes are already built stiff enough to handle heavy loads, so this isn’t often a problem (unless you have heavy front panniers). Comfort isn’t just about vertical stiffness. Getting a frame that is your size and that suits your riding style will make a significant impact on how comfortable your bike feels to you. Finding a comfortable seat, seatpost and grips will go a long way too. Any frame material can be used to build a stiff bike. Frame manufacturers essentially make trade-offs by selecting different tube diameters and wall thicknesses, allowing a frame to be made stiffer, or stronger, or lighter. Touring frames are perhaps the stiffest of all frame varieties (and also the heaviest!) because they carry heavy loads on the front and rear, requiring a stiff enough chassis to reduce twisting. 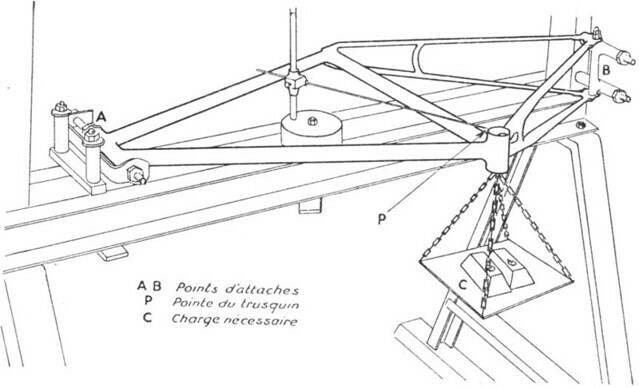 A diagram showing stiffness testing on a bike frame. Frame stiffness is often the first thing I take note of when I test ride different touring bikes. 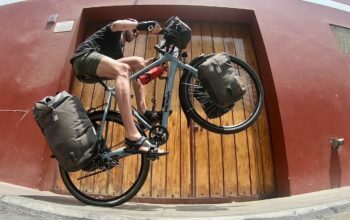 It’s one of the most important characteristics on a touring bike with front and rear panniers because it improves the handling at high speeds and prevents speed wobbles. The goal of any good frame manufacturer is to put frame material only where it’s needed. Aluminium and titanium are known for being lighter weight than steel – but is this true? A process called ‘butting’ is designed to reinforce the joints at the end of frame tubes, making frames more robust. By taking material from the inside of a tube, it can be optimised for stiffness and strength… but also weight. Good frame manufacturers will use a number of tubing diameters with different length tapers and butts across their size spectrum, optimising their tube characteristics for a touring bikes purpose (to be stiff and strong). A titanium frame that is equal in strength to a steel frame is about half the weight and half the stiffness. To increase the frame stiffness to an adequate amount, titanium manufacturers use large diameter tubing. This results in a frame that is strong and stiff, yet often lighter (and more expensive) than steel. 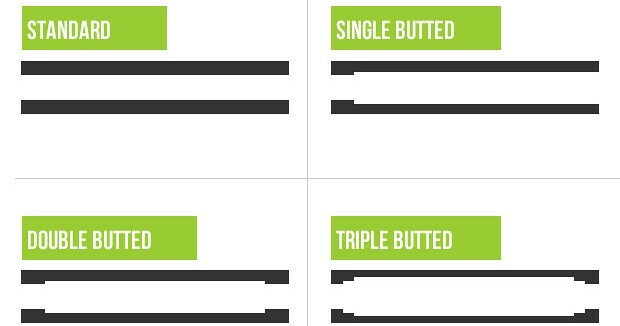 A diagram showing the different styles of butted tubes. An aluminium frame is about a third as stiff, a third of the weight and half as strong as a steel frame with the same tubing specifications. You’ll notice that like titanium frames, aluminium frames also require large tubing diameters with thicker walls in order to maintain adequate strength and stiffness. 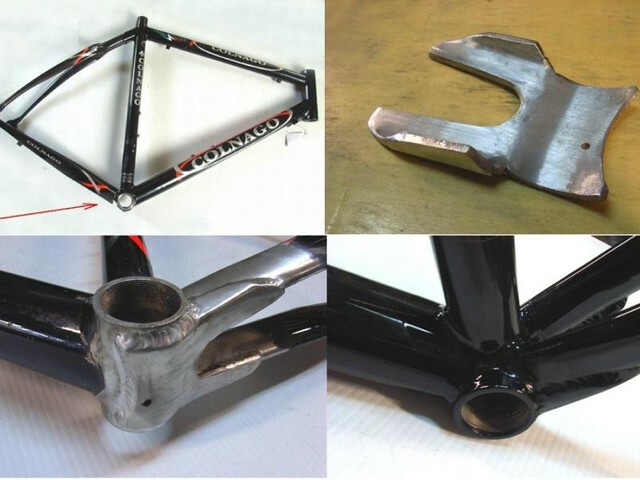 Despite using more metal, bike frames made out of aluminium tend to be lighter than both titanium and steel. Which is the Easiest to Repair and Modify? All frames are repairable. Steel is the easiest to repair, but don’t expect your roadside repair in Kyrgyzstan to be a permanent fix. Steel tubing is very thin compared to most industrial products and unless the welder is familiar with bicycle frames, there’s a good chance your frame will end up damaged in the welding process (although the quick fix may well keep you going). Aluminium and titanium frames are repairable too; they, however, require more sophisticated tooling and expertise. For a repair on any frame (aluminium, titanium or steel), a ‘weld up’ over the top of a crack is not enough. 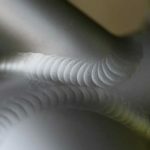 To make the weld strong, new material is required in the form of a gusset or sleeve. Professional frame builders can modify steel frames relatively easily – just about anything can be replaced or redone. You can attach bidon points and disc brake tabs; you can even replace head tubes and re-space rear ends! Gripsport in Australia complete frame repairs using gussets and sleeves to ensure the frames are repaired back to their original strength. In my experience, strength comes mostly from the design and build-quality of a frame, rather than the material it is built with. A high-quality frame is actually quite unlikely to break on a bike tour unless it goes through a traumatic experience such as a big crash. Steel and titanium frames have a ‘fatigue limit’ below which a repeated load (frame flex) can be applied an infinite amount of times without causing failure. Aluminium, on the other hand, has no fatigue limit, meaning that it will eventually fail after enough load cycles. Although the lack of fatigue strength in aluminium frames seems alarming, they are actually engineered to be three or more times stronger than a steel frame, easily withstanding the stresses of bicycle touring. In summary, a well-designed frame of any material won’t be affected by fatigue. After developing a defect, some materials separate quicker than others. Steel and titanium frames tend to bend and dent rather than shattering or snapping, providing you with a bit more warning between when you first notice a crack to when it ultimately fails. On the other hand, aluminium frames tend to develop cracks quickly and give way with a lot less warning. Aluminium bolt threads are softer than steel threads. This can sometimes result in stripped out threads if you aren’t careful. Make sure to use a little grease on your bolts and pay attention to your bolt going in straight. Steel is vulnerable to rust, but it is rare that a bike frame will actually fail for this reason. Just check out how many 30-50 year old steel frames still get around despite living outside! The reason rust isn’t a huge problem is that steel tubes are relatively thick, and are coated with paint. You should apply anti-rust sprays inside your frame periodically, especially if you spend time in wetter climates. It’s also a good idea to touch up the paint on your steel frame from time to time too. Frames can break in many different ways! Make sure to inspect yours regularly. Aluminium, titanium or steel, choose a frame that was intended for touring, with a smart design and whose manufacturer is known for producing good touring bikes. Brands like Santos and Koga do wonderful things with aluminium. Surly and Thorn are known for their steel. Van Nicholas works titanium well. My personal preference is for steel due to its relatively low cost, its defect tolerance and ease of modification. 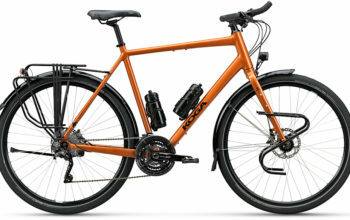 Here are some links to my steel Surly Long Haul Trucker and Co-Motion Tandem. For a more technical read on this stuff (terminology galore! 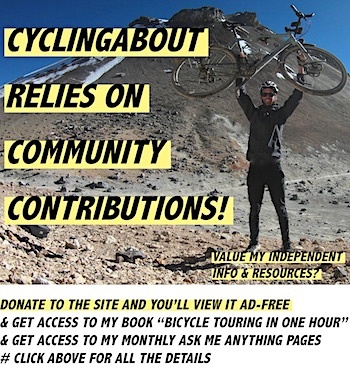 ), head over to Ibis Cycles or SheldonBrown.